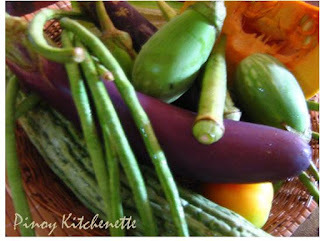 Pakbet or Pinakbet is another native Filipino mixed-vegetables dish. There are also variations in cooking this, but they say the most delicious one, is the aunthentic Pakbet Ilocano of Ilocos where the dish originated. My recipe version is the Pakbet tagalog, this one done with sauteeing first, and has tomatoes in it. But basically, the main engredients are the same - all fresh vegetables such as kalabasa sitaw , talong , ampalaya, and okra. And with Bagoong included as seasoning. Everytime I order this dish in our local restaurants, I would always have it paired with lechon kawali (crispy pan-fried roasted porkbelly). 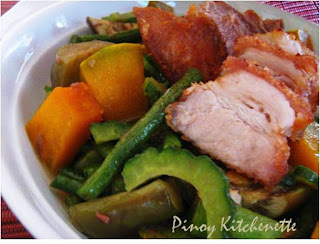 So in this recipe, I did not include pork meat strips in cooking Pinakbet, instead I made my own lechon kawali, and make this as toppings to the Pinakbet. Sarap! Boil water in a pot. Season the pork(except the skin part) with half of the seasoning (salt and paprika). Drop the meat in the boiling water.Cover.Cook in low heat for about 20 minutes. Remove the meat from the pot, then rub the meat sides (just the meat part not the porkskin)with the rest of salt and paprika. In a separate pan, deep fry the meat.Cook until golden brown and crisp. Chop.Set aside. Heat oil in pan. Saute ginger, onions, garlic and tomatoes. Add bagoong, then the meat broth. Boil. Add the kalabasa and okra, cook for 2 minutes. Then add the sitaw, talong and ampalaya. Cover. Simmer for 3 minutes. Adjust the taste.Add salt if needed. Then cook for another 3-5 minutes, or until the vegetables are tender. Serve in plate, topped with the lechon kawali. Enjoy! Margarita, what a great and healthy dish! I love mixed vegetable dishes so much! And the pork...wow! Would love to try out this one! This is an authentic filipino dish and I really appreciate the way you cooked it. Bravo! Thank for liking it Purabi! Wow! This is indeed so yummy! I hope everyone gets the chance to read this. thank you for your nice words! hope you'll visit back. Have a nice day! Hi Margarita! 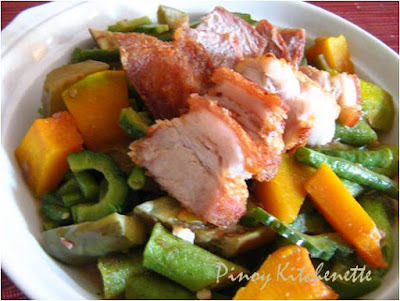 I love pinakbet and with lechon kawali, I love it even more. Thank you very much for dropping by my site and commenting. It's nice meeting you.